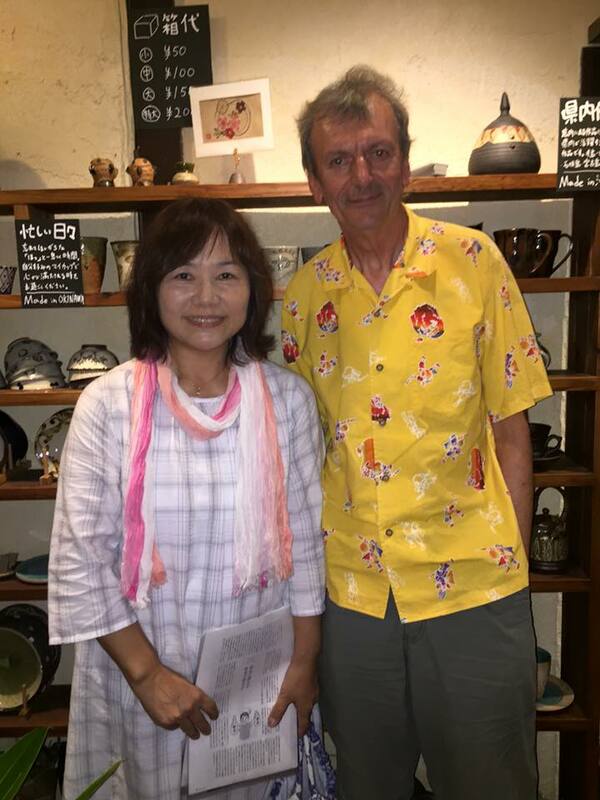 Last night there was a combined cinema and awamori tasting event in Itoman at the Do-mu cafe which is also an art gallery with displays of Okinawan pottery. This was an evening for the tasting of the high class White Tiger awamori which is sold only at Naha airport. An expert gave an interesting talk on the background and history of awamori while the rest of us sampled some of the results. 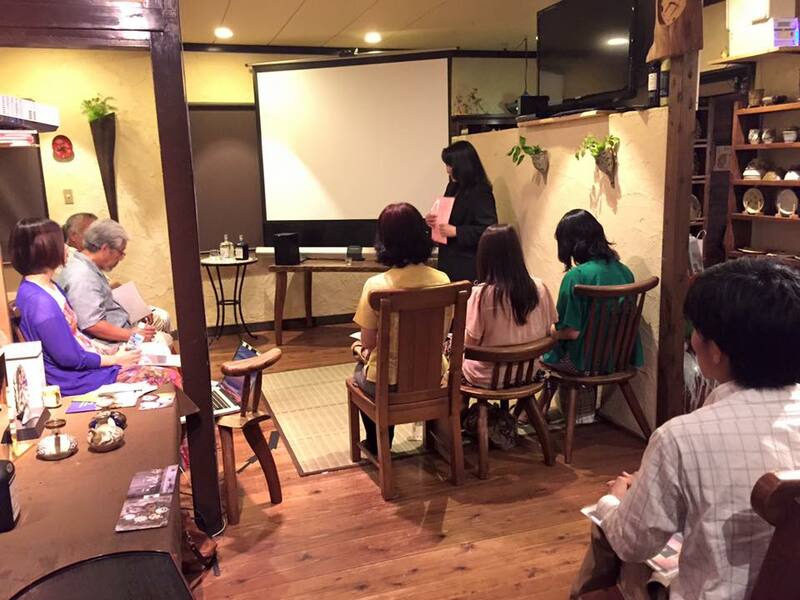 Her talk was followed by a screening of the Claude Gagnon film Karakara which was introduced by the movie’s producer Takako Miyahira. 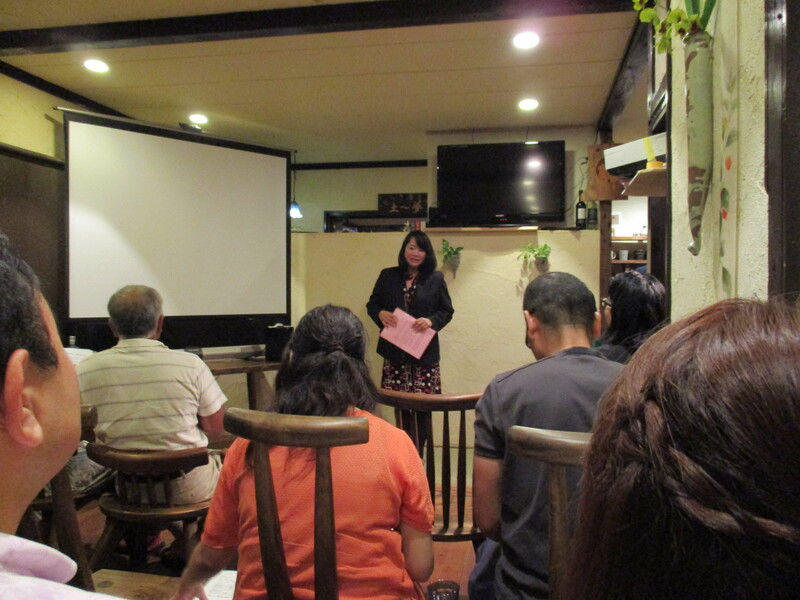 A similar event will be held in Naha at Awamori Soko on the 28th June at 7 pm. 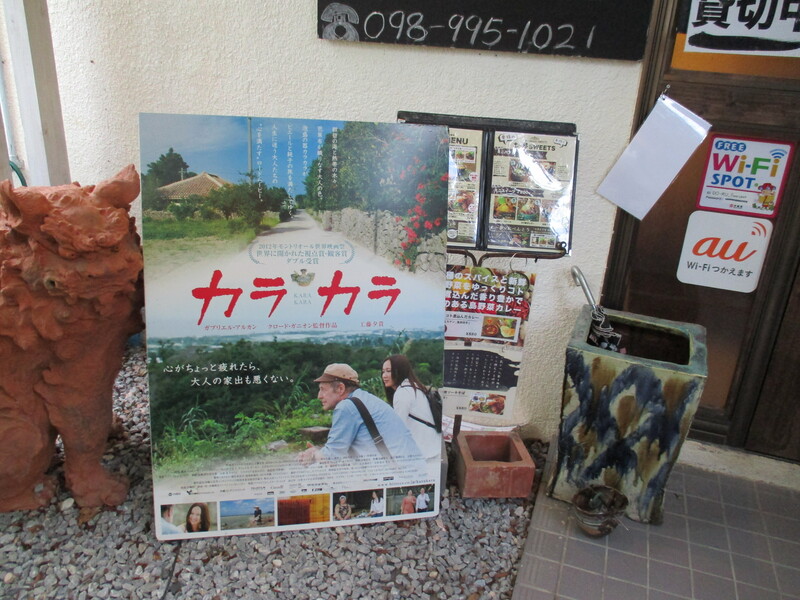 The DVD of the movie Karakara was released on 11th December and is now available at CD and DVD shops throughout Okinawa. 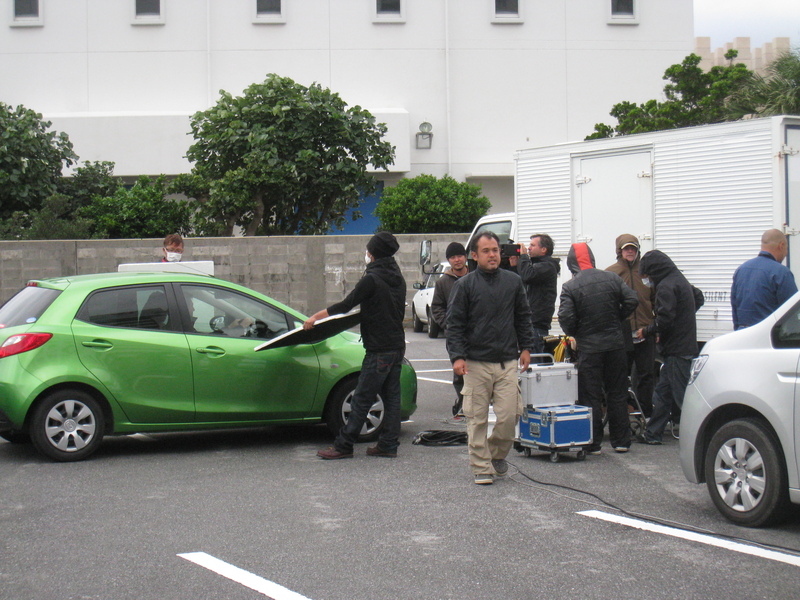 It can also be ordered online through the website of production company Kukuru Vision. 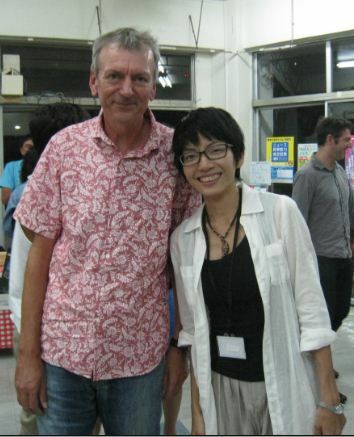 Karakara has been featured several times on this blog – not least because I was involved in a small acting role. The experience of taking part in the film and meeting the cast and staff to work (and play) with was more enjoyable than I had ever imagined. I made many new friends and have lots of good memories. 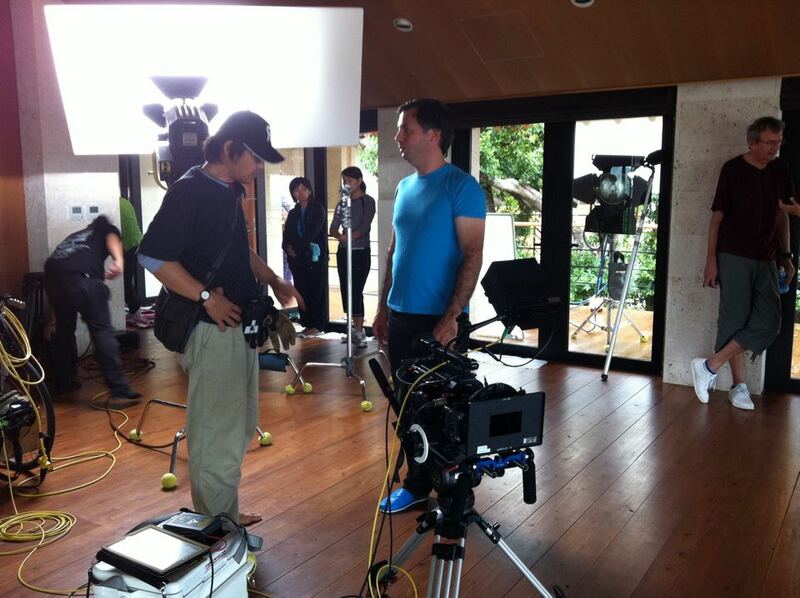 Behind the scenes: 1st assistant director Masato Tanno and Director of Photography Michel St-Martin prepare for shooting. I’m already in the driver’s seat as we get ready for the famous car scene. 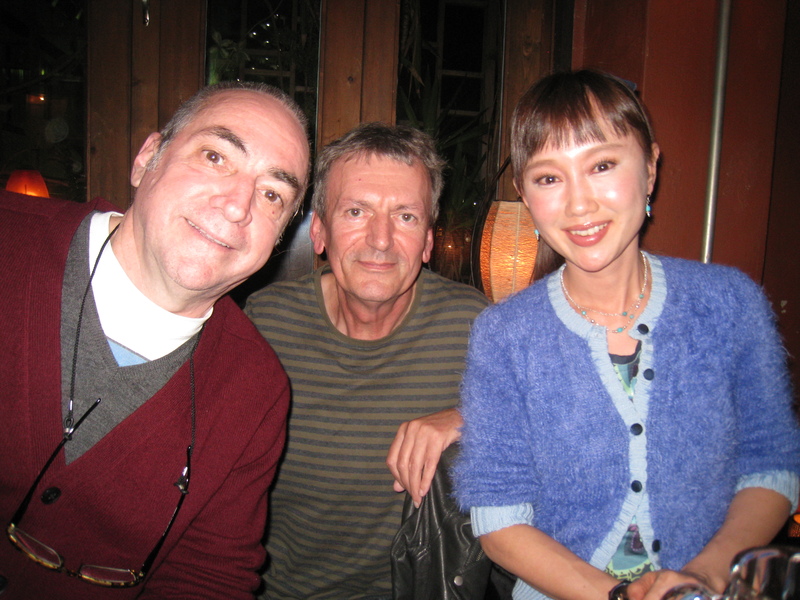 If there’s any reader here who doesn’t already know, Karakara is a Canada-Japan co-production written and directed by Claude Gagnon. 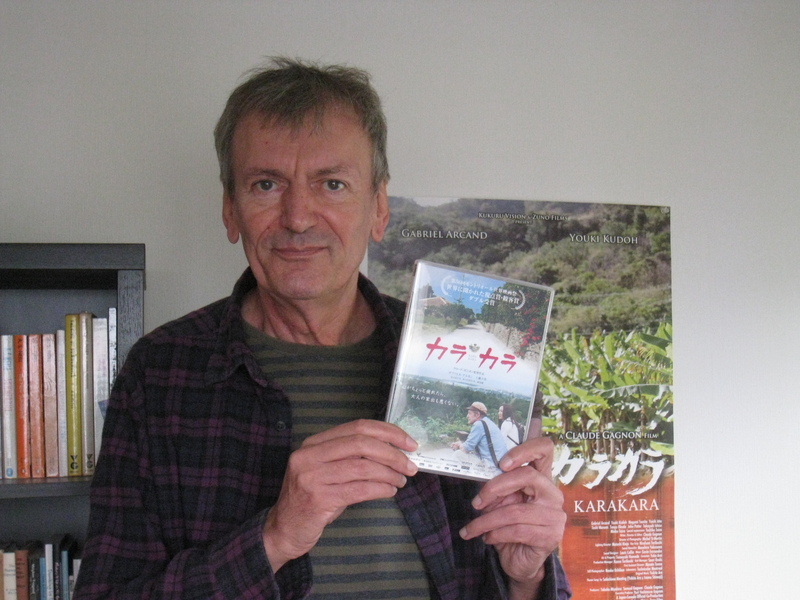 It stars French-Canadian actor Gabriel Arcand as Pierre, a retired professor on a trip to Okinawa where he meets Junko, a Japanese housewife played by Youki Kudoh (Mystery Train, Snow Falling on Cedars). Original music for the film was composed by Yukito Ara. 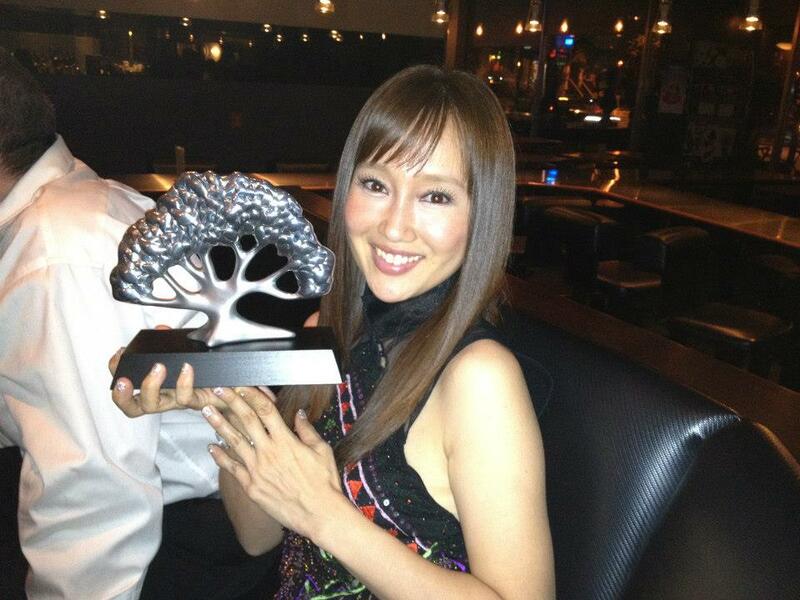 The movie won two awards at the 2012 Montreal World Film Festival. 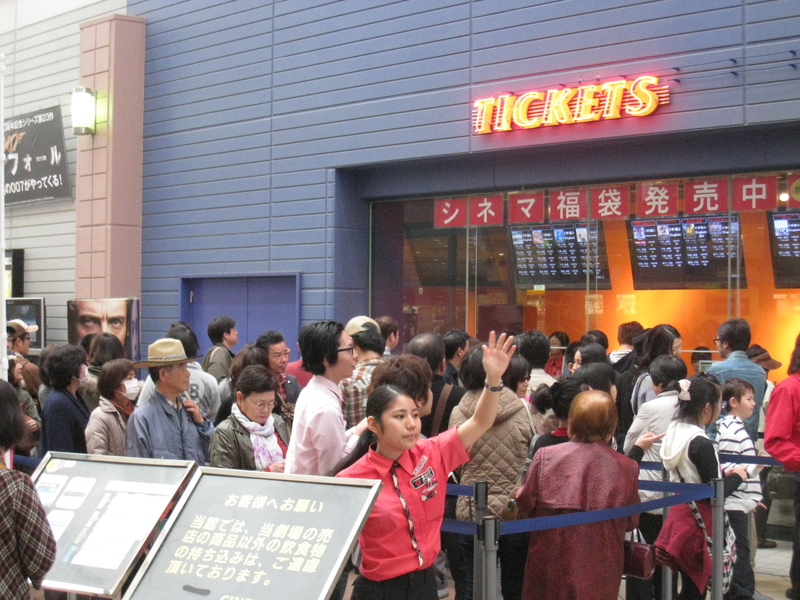 The Canada-Japan co-produced movie Karakara finally opened at two cinemas in Okinawa yesterday and all three screenings were sold out. 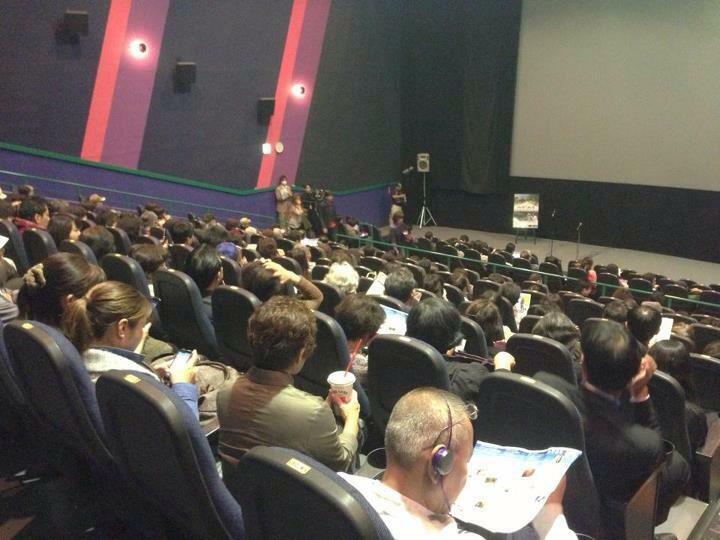 I attended the first of these at Cinema Q in Naha. 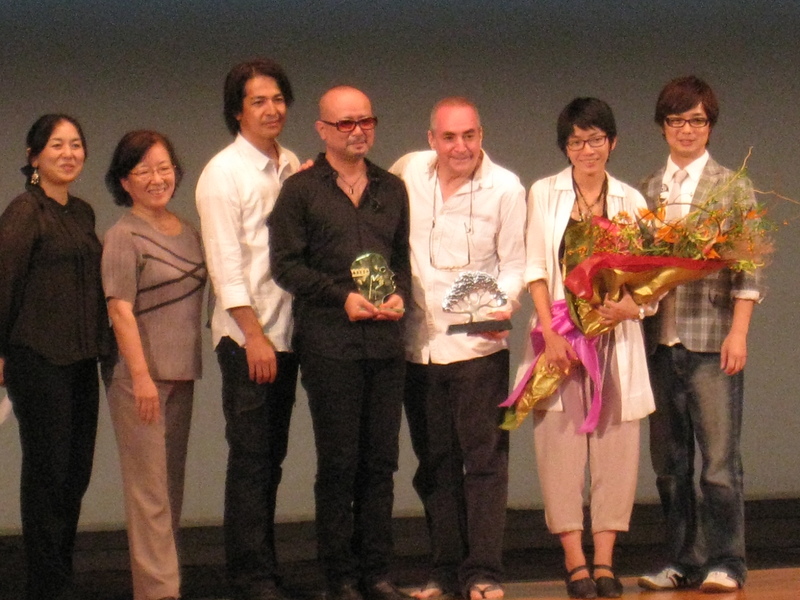 The movie’s star Youki Kudoh came to Okinawa for the opening and she was introduced to the cinema audiences along with writer/director Claude Gagnon, producer Takako Miyahira and musicians Yukito Ara and Isamu Shimoji. The film opens at venues across mainland Japan from the 19th January. 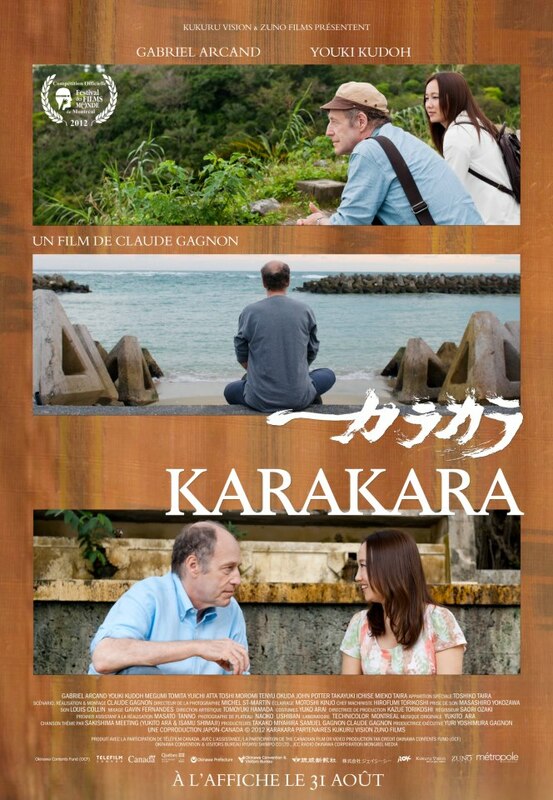 Karakara is then screened in Paris at the ‘Cinema du Quebec a Paris’ event from 6th to 11th November. 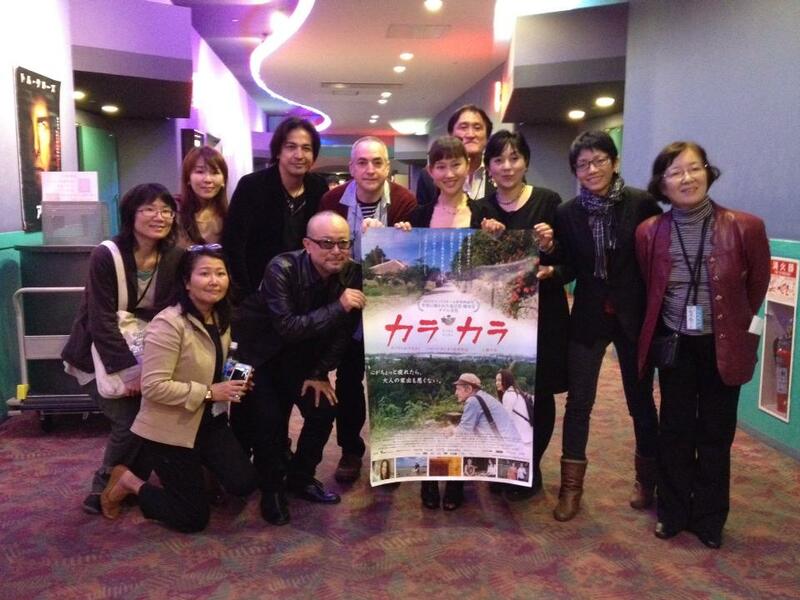 The movie Karakara was screened in Okinawa for the first time last night in conclusion of the Bonjour Quebec! cinema week. Fortunately, the weather had returned to sunny skies after a typhoon had forced the postponement of the previous day’s events. A large audience responded enthusiastically to Claude Gagnon’s road movie set on these islands. Before the screening there was a live performance on stage of the film’s theme song ‘Tumi Dumi’ by Yukito Ara (vocal, sanshin) and Isamu Shimoji (guitar). Ara composed the song and wrote the music for the film. 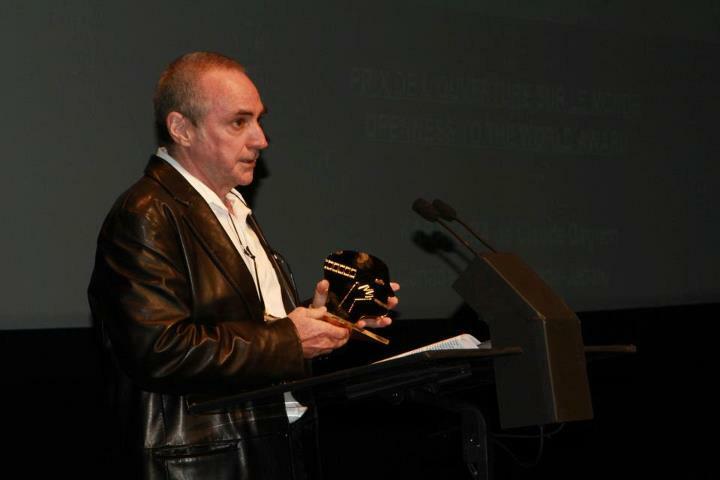 Director Claude Gagnon and some other members of the cast and staff were also interviewed on stage before the screening and they showed off the two awards won at the Montreal World Film Festival. Karakara is already being shown in Canada but Japanese audiences must wait until January for its general release. 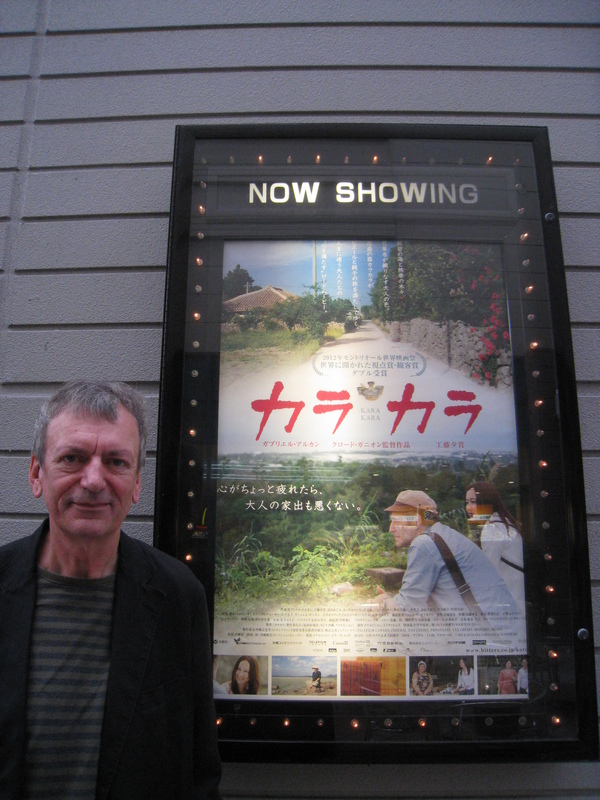 In Okinawa it will open at Cinema Q in Naha on 12th January 2013. It will be shown throughout mainland Japan from the 19th January at cinemas in venues including Tokyo, Osaka, Kobe, Kyoto, Aichi, Fukuoka, and Sapporo. 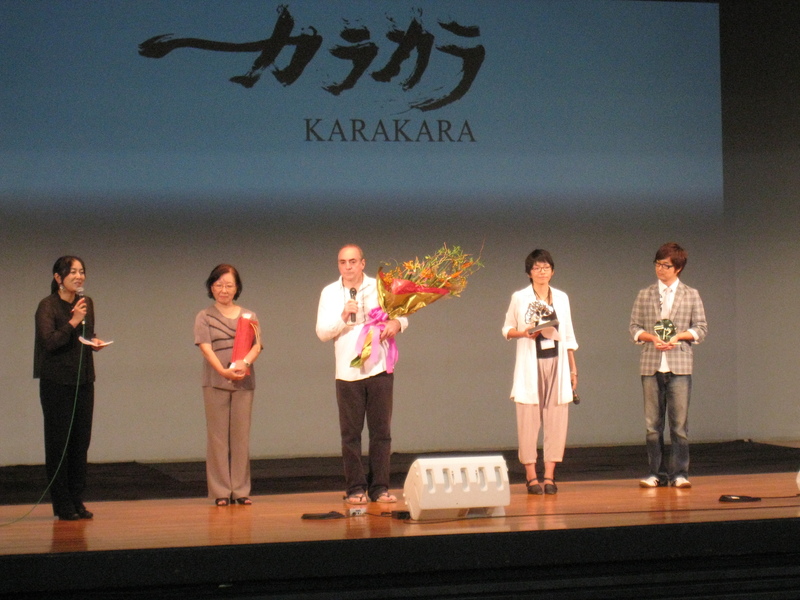 The Japanese-Canadian co-production Karakara was the winner of two awards at the 36th Montreal World Film Festival on Monday. 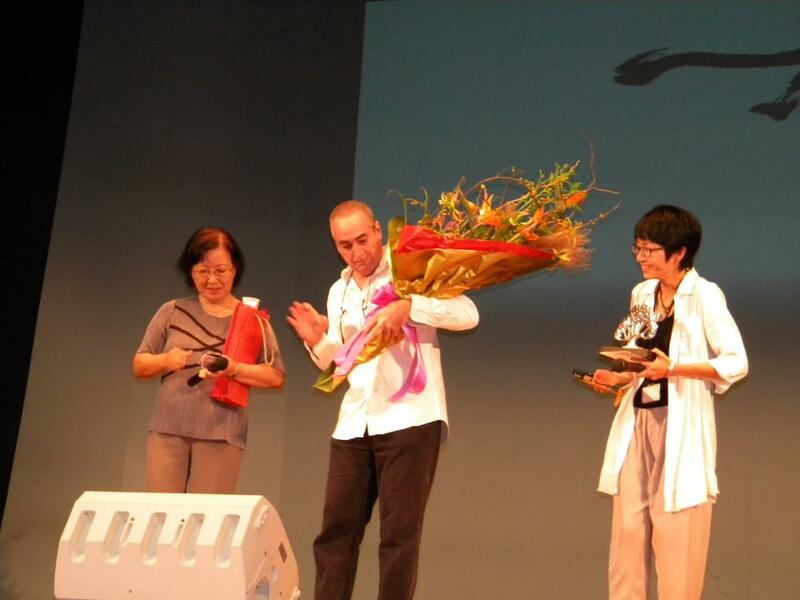 The movie, which was set entirely in Okinawa, won the ‘Openness to the World Award’ and also the prestigious ‘Public Award’ for most popular Canadian feature film. I was very proud to have been able to contribute something to the film, however small. 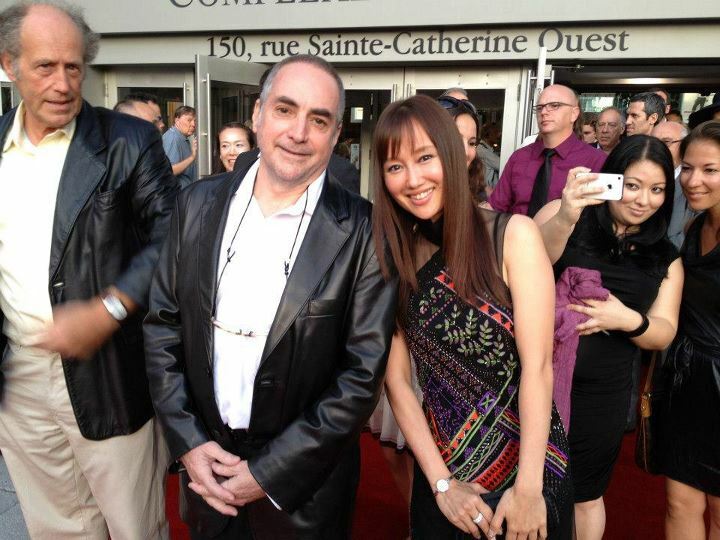 Gabriel Arcand, Claude Gagnon and Youki Kudoh on the evening of the closing ceremony in Montreal. Director Claude Gagnon makes acceptance speech. 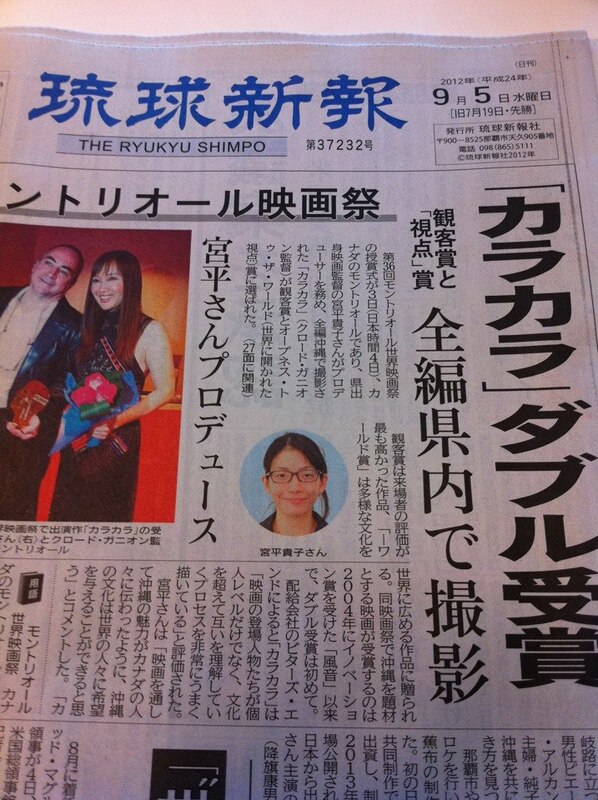 The awards make front page news back in Okinawa. The Okinawan premiere of Karakara takes place on 17th September at Ryukyu Shimpo Hall in Naha where it will be the closing film in the Bonjour Quebec! cinema week. It then goes on general release throughout Japan in January. Original music for the movie has been written and performed by Yukito Ara and the theme song is performed by the duo Sakishima Meeting (Yukito Ara and Isamu Shimoji).